Vancouver, British Columbia--(Newsfile Corp. - March 1, 2018) - Thunderstruck Resources Ltd. (TSXV: AWE) ("Thunderstruck") is pleased to report that recent exploration results have confirmed the presence of a large gold-copper mineralized porphyry stock at the Rama Creek project in Fiji. The recent work has also resulted in the discovery of a zone of broad, possibly structurally controlled, gold mineralization. Rama Creek is part of an extensive property position held by Thunderstruck on Viti Levu, the main island of Fiji, and is located south of the Vatukoula mine, which has produced 7 million ounces of gold. The Thunderstruck property is located between the Tuvatu gold deposit of Lion One, which is now in development and Newcrest's Namosi (Combined reserves and resources of 16 million ounces gold, 15 million tonnes copper). The property held by Thunderstruck was first explored by Anglo American in the 1970s. The recent field work built on the earlier results and was intended to test the extent of the porphyry system and to follow up on historic gold soil anomalies. Between October and December 2017, Thunderstruck crews completed the collection of 126 targeted auger soil, 102 prospecting rock grab, and 35 follow-up BLEG stream sediment geochemical samples at the Rama Creek Prospect. In addition, 59 metres of hand trenching at the Senikura West gold target, located 1 km south of the Rama Creek Porphyry, tested an historic gold-in-soil anomaly. Trench results include 11.1 meters of 0.96 g/t gold. Commenting on the results, President/CEO Bryce Bradley notes, "This recent work confirms a mineralized gold-copper porphyry system at least a kilometre in diameter, which remains open to the north and south. The trenching showed the significance of the peripheral gold-in-soil anomalies, giving us a discovery in the first test, with several other anomalies yet to be tested. Having verified and extended the results of the historic work at Rama, and having done the same earlier at our various other targets, Thunderstruck's Fijian properties are beginning to attract considerable interest in the mining industry." Director Lawrence Roulston notes: "The island of Viti Levu hosts multiple multi-million-ounce deposits, demonstrating the highly productive geological environment. Fiji is on the tectonic boundary between the Pacific Plate and the Australian Plate. This same tectonic feature hosts other large deposits, including Lihir and Grasberg, two of the biggest gold deposits in the world. This is the right environment to be searching for large deposits and the results to date are highly encouraging." At Senikura West, target specific auger soil sampling was designed to confirm an historic gold in soil anomaly (4 samples ranging from 107 to 511 ppb Au). Thunderstruck crews collected a series of 10 consecutive auger soil samples collected over a distance of 100 m along a northeast trending ridgeline, which returned an average of 0.47 g/t Au, with individual samples ranging from 0.029 g/t Au (29 parts-per-billion Au) and up to 2.13 g/t Au (Figure 1). In addition, a single soil sample collected 40 m to the northeast returned 1 g/t Au. The 10 samples form part of a broader zone of 20 auger soil samples collected over 200 m along the ridge returned an average of 0.3 g/t Au, with the northern and southernmost samples returning 0.10 and 0.27 g/t Au, respectively. The Senikura West gold in soil anomaly remains open to the north and south. As a follow-up to detailed auger sampling, a 59 m northeast trending trench was excavated centered over the highest gold in soil values. The Senikura West trench returned, 0.96 g/t Au over 11.1 m (38.5 to 49.6 m), within a broader anomalous gold zone averaging 0.55 g/t Au over 37.6 m (12 to 49.6 m) (Table 1). The relationship of the trenched intervals to the true width of mineralization is not known. A total of 18 auger soil samples were collected over a 240 m northwest trending ridgeline at the interpreted centre of the Rama Creek Porphyry Cu-Au target. The soil line transects a prominent magnetic high anomaly and historic 1974 Australian Anglo American Ltd (Anglo) diamond drill hole "DDH1" that returned a 244 metre interval between depths of 6 and 250 metres averaging 0.22% Cu, ending in mineralization. Thunderstruck's 18 auger soil samples returned an average of 0.27% Cu and 0.15 g/t Au; with individual copper and gold values ranging from 0.05 to 0.68% Cu, and 0.004 g/t Au (4 ppb Au) to 0.34 g/t Au, respectively (Figure 2). Along the interpreted southern margin of the porphyry, 600 m to the south of DDH1, a series of 31 auger soil samples collected over 500 m along a north trending ridgeline transect the mapped edge of the intrusion. Progressing northward from the interpreted southern edge of the intrusion, a total of 23 auger soil samples collected over 400 m averaged 452 ppm Cu. The northernmost six (6) auger soil samples collected over a distance of 120 m in an area flanked by thick alluvium returned an average of 0.11% Cu, with individual values ranging from 331 ppm Cu up to 0.23% Cu in soil. In addition, ten (10) auger soils collected over a 100 m distance spanning the contact zone of the intrusion returned anomalous gold values averaging 0.063 g/t Au (63 ppb Au); including two samples returning 0.1 and 0.2 g/t Au. The nature of this gold in soil anomaly bears similarity to the Senikura West gold target located 700 m to the southeast; as well as that of the broad historic Senikura East gold in soil anomaly located a further 1.5 km to the southeast (12 consecutive 100 m spaced auger soils over 1.2 km returning an average of 67 ppb Au). Based on the orientation of northwest-southeast trending creek drainages and historic geophysical interpretation, it's possible the two anomalies are related to a zone (or zones) of structurally controlled gold mineralization along the margin of the Rama Creek porphyry. Exploration by Barringer Fiji Ltd. (Barringer) prior to 1974 at Rama Creek defined an approximately 1 km diameter composite quartz-diorite porphyry stock regionally assigned to the Tholo Plutonic Suite. Barringer collected a total of 469 soil geochemical samples at 60 m intervals at Rama Creek along a series of 100 m spaced northwest-southeast trending gridlines. The survey defined an approximately 800 m diameter greater than 400 ppm Cu in soil geochemical anomaly surrounded by a peripheral halo of anomalous zinc values. The historic copper anomaly is cut off sharply to the north by volcanic derived colluvium, to the east by a steep ridge, and to the south and west by thick alluvium. Within the centre of the anomaly, quartz-diorite porphyry rocks and Wainimala Volcanic Group rocks they intrude are highly altered to an assemblage of silica-sericite-chlorite-pyrite-magnetite, and locally secondary biotite. Mineralization consists of disseminated and fine fracture controlled pyrite-chalcopyrite-bornite and covellite. Historic Induced Polarization (IP) / Resistivity and ground magnetic surveys, also by Barringer, reveal distinct concentric chargeability and conductive anomalies about the margin of the copper anomaly. Within the core of the anomaly altered and mineralized porphyry intrusive rocks are resistive and locally strongly magnetic. As a follow-up to the initial BLEG stream sampling program at Rama Creek (see the Company's September 27, 2017 News Release) Thunderstruck collected an additional 35 BLEG stream sediment samples in the headwaters of Rama and Senikura Creeks draining the Senikura West gold target area. (Bulk Leach Extractable Gold, more commonly shortened to BLEG, is a geochemical sampling/analysis tool used for gold exploration.) In conjunction with the results of 110 BLEG stream sediment samples already released for the Rama Creek Prospect, a total of eight (8) samples returned greater or equal to 13 ppb Au (>95th percentile); and six (6) samples greater than or equal to 6.4 ppm Cu (>95th percentile). At the centre of the Rama Creek porphyry, a single BLEG stream collected 200 m downstream from Anglo drill hole DDH1 returned 0.1 g/t Au and 109 ppm Cu, the highest gold and copper BLEG stream value returned to date on the Project. 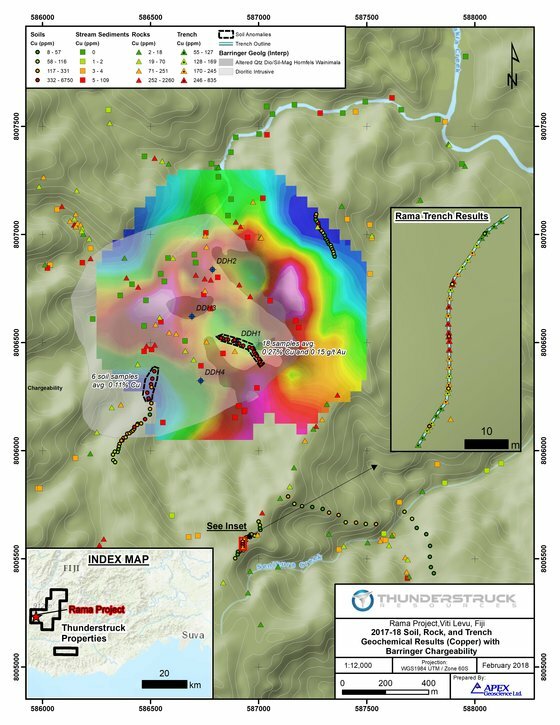 Combined, the 145 BLEG stream sediment samples collected to date define >95th percentile gold and copper anomalies within streams draining the core of the Rama Creek Cu-Au porphyry target, and >95th percentile gold anomalies within streams draining west and east of the Senikura West gold target. A total of two (2) separate drainages west of Rama Creek returned BLEG stream values of 18 ppb Au; and 13 and 14 ppb Au, respectively and may represent as yet unknown gold targets (Figure 1). Surface rock grab sample results represent both in-situ outcrop and loose creek flat material. The majority of rock grab samples were collected from narrow immature drainages, and as such transport distance of float rock material is considered to be short. In general outcrop in the Rama Creek area is limited, particularly in the area of historic drilling, with sporadic outcrop exposures present in scoured creek beds, and as positive relief features along ridgetops. Of the 102 rock grab samples collected to date at Rama Creek a total of 12 returned greater than 500 ppm Cu and are considered anomalous. Of the 12 rock grab samples, 6 samples returned greater than 0.1% Cu and up to 0.26% Cu. Of the 102 rock grab samples, a total of 6 samples returned greater than 0.1 g/t Au (up to 0.24 g/t Au) and are considered anomalous (Figure 1). The work by Thunderstruck and previous operators at Rama Creek has confirmed the presence of a 1 km diameter composite quartz-diorite copper-gold mineralized porphyry intrusive stock. Intensely silica-sericite (±biotite) altered porphyry is surrounded by a highly chargeable magnetite-pyrite-chlorite shell within less altered diorite and host Wainimola Volcanic rocks. The full extent of mineralization is obscured to the north by volcanic colluvium and to the south by thick alluvial deposits. Current auger soil geochemical sampling and surface trenching by Thunderstruck has resulted in the discovery of peripheral zones of broad, possibly structurally controlled, gold mineralization. Limited trenching to date has yet to define the north-south limits of the Senikura West gold zone, and a separate possibly related gold in soil geochemical anomaly 700 m to the northwest has yet to be tested by trenching. Moving forward, Thunderstruck plans to continue advancing the Rama Creek porphyry gold-copper prospect through completion of early 2018 IP/Resistivity surveys towards modelling the subsurface geometry of disseminated sulphide mineralization and generation of finalized diamond drill targets. In addition, further evaluation is planned of the numerous spatially associated gold targets. The Company has arranged a non-brokered private placement to raise up to $400,000 through the sale of up to 5,000,000 units at a price of $0.08 per unit (the "Financing"). Each unit will comprise one common share and one share purchase warrant. Each whole warrant will entitle the holder to purchase a further common share at a price of $0.15 per share for a period of 36 months from closing. The warrants will be subject to accelerated exercise provisions such that if the closing price of Thunderstruck's common shares exceeds $0.25 per share for a period of 20 consecutive trading days, Thunderstruck may give notice of the acceleration of the warrants' term to a period of 30 days following such notice. Proceeds of the Placement will be applied to continuing operations on the Company's Fiji properties and general working capital. During 2017 all stream sediment samples were submitted to Australian Laboratory Services Pty. Ltd (ALS) labs Perth for BLEG determination of gold, copper and silver. Auger soil samples were submitted for gold and multi-element geochemical analysis via a 25 gram (g) sample split subject ICP-MS. Prospecting and trench rock samples submitted for 30g gold Fire-Assay analysis and multi-element geochemistry by four-acid ICP-ES. Thunderstruck has relied on the external QA/QC of ALS which included the insertion of insertion of standard, blank and duplicate samples at a rate of 10% into the sample stream to confirm the accuracy of the reported results. *Surface trenches were dug by hand to a maximum depth of 1m into saprolite with the goal of reaching weathered in-situ bedrock approximating the B/C soil profile transition. In all cases where the B/C transition was reached pervasively clay altered saprolite rock present often showing relict primary textures, alteration and mineralization in the form of weathered sulphide minerals.